5/1/2015 Note: after examining election-day transits for Barack Obama in 2004, which are similarly very Neptunian, I am no longer convinced that Paul would necessarily lose a general 2016 election. I'll refrain from prognosticating on future elections until I've had time to study the subject in detail. Conservative icon Rand Paul has proven himself in a short period of time to be both more principled than virtually all of his colleagues in the US Senate -- and also adept in surfing the waves of public opinion in ways that his pure-libertarian father Ron Paul is not. In addition, unlike his fellow Tea Party leader Ted Cruz, he possesses a crossover appear to elements on the Left who are capable of accepting well-reasoned arguments. All of this puts him in a place his father very recently occupied: a potential contender for the US presidency. Rand Paul's chart with transits and progressions gives us a possible post-election-day scenario should he wind up on the presidential ballot. 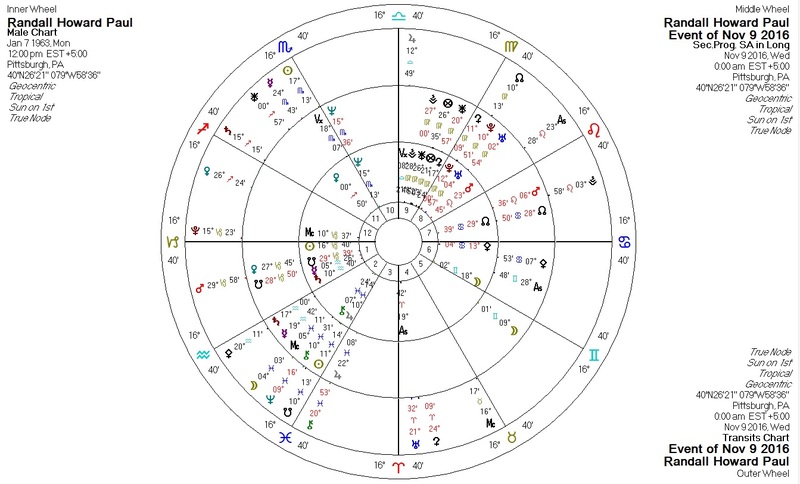 Transiting Pluto conjunct Paul Sun: Pluto hits the Sun on this chart all year, suggesting great upheaval and possibly power. Certainly this slow-moving transit is consistent with a year in the spotlight in relation to political power. Transiting Mars conjunct Paul South Node: This fast-moving transit suggests some sharp bad news or loss on election day. Transiting South Node and Neptune conjunct Paul Jupiter and progressed Sun: More indicators of loss (South Node and Neptune), involving politics/publicity (Jupiter) and self-image (Sun). Transiting Sun conjunct Paul Neptune: Yet another indicator hinting at a loss. Transiting Mercury square Paul Mars: Inconvenient news. Ron Paul ran for president three times, understanding full well that his chances of winning were slim. He did so nevertheless in order to spread a message about freedom, peace, and prosperity which continues to inspire Americans to work to fight the corruption of their nation's current political system. In this way, his losses were in fact victories. Should the younger Rand Paul decide to run in 2016, he might do well to bear this attitude in mind... because the astrology for him on election day that year is not promising. Sadly, this does not bode well for re-election to the Senate, either. Astrology suggests that Rand's career may echo his father's not only in general ideology but also in that Ron's congressional career also experienced an interruption.